The air mix control servo motor sends pulse signals to indicate the damper position to the A/C amplifier. The A/C amplifier activates the motor (normal or reverse) based on these signals to move the air mix damper (front passenger side) to any position. As a result, the amount of air passing through the heater core after passing through the evaporator is adjusted, and the temperature of the air blowing toward the passenger side is controlled. (d) Operate the front passenger side temperature adjustment switch. 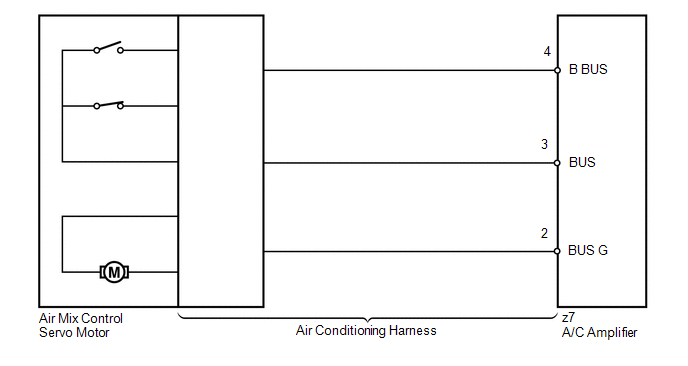 (a) Replace the air mix control servo motor (See page ).